Boy Genius Report managed to get their hands on a photo of the unknown till now LG Xenon. Turns out that it’s an AT&T branded handset that will be available at Christmas time. 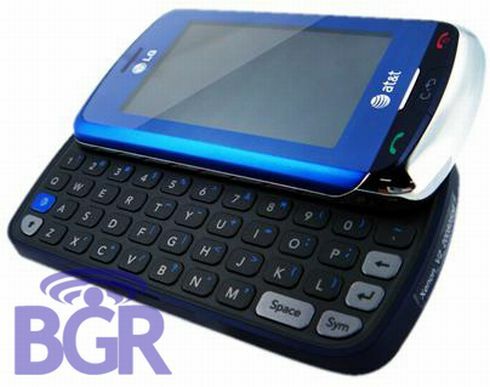 Hmm… a slider device with a QWERTY keypad a day after the T-Mobile G1 announcement? Do I smell rivalry? A quick look at LG Xenon’s specs reveals the presence of a 3 megapixel camera, A-GPS, Wi-Fi, an accelerometer and a 950 mAh battery. Add the usual Bluetooth 2.0, USB 2.0 to that, plus a proximity sensor and 100 MB of internal memory and a microSD slot that adds another 16GB in the mix. LG Xenon also incorporates a 240 x 480, 2.8″ LCD display and an EMP U330 Lite chipset, all of these “hidden” inside a 105.5 x 53.5 x 15.8 mm shell.